Instead of installing web design software on your computer, WordPress actually includes all of the website creation and editing tools right inside of the WordPress install on your web server. In order to access them, you need to log into your Admin Dashboard. By using the quick install feature on Bluehost, you’ll quickly become annoyed at some of the default plugins that come preinstalled. Specifically, the Mojo Marketplace plugin. It stuffs new menus and buttons all over the place to try to get you to purchase a premium theme. 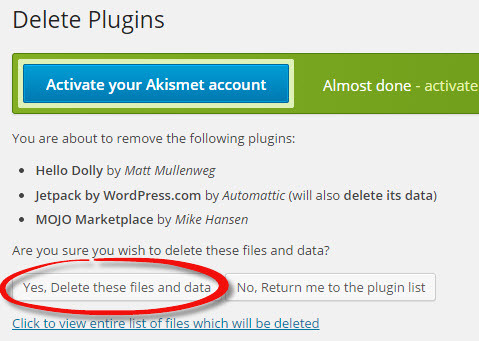 If you find that annoying, you can easily disable and delete that plugin. Click on the Plugins button in the lefthand side menu. Click the checkbox alongside the plugins you want to deactivate. Hello Dolly, Jetpack, and Mojo Marketplace are all unnecessary plugins. In the Bulk Options dropdown menu, select Deactivate, and click Apply. Now that you’ve deactivated the plugins, you can now delete them. (You can always reinstall plugins later. The only time you wouldn’t want to delete a plugin is if there were settings in the plugin that you don’t want to lose.) Click the checkboxes again, in the Bulk Options dropdown menu, select Delete, and click Apply. Click Yes, Delete these files and data to confirm that you want to delete these files.